Sometimes it’s the little details that count, like having a pretty pincushion to hold all your pins in place. A pincushion can say something about your personality, can coordinate with or match your sewing space, and can make a wonderful little gift for a sewing friend. Here are some free pincushion projects to get you inspired to stitch up your own pretty pincushion. 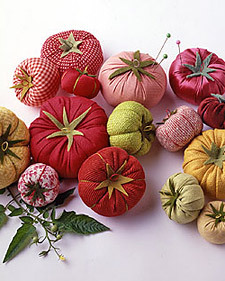 Use Martha Stewart’s classic Tomato Pincushion pattern and tutorial to make your own interpretation of this time-honored project; you can stick with traditional red, or mix it up with your favorite fabric. If you want to try an updated pincushion, give Heather Bailey’s Square Deal a go. A great project for using up your little scraps of fabric, spare buttons and snippets of trim! 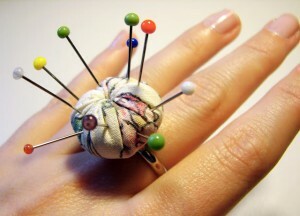 And for something completely different, try Trish Preston’s totally adorable Ring Pincushion tutorial. These are so cute and clever you won’t want to stop at just making one! 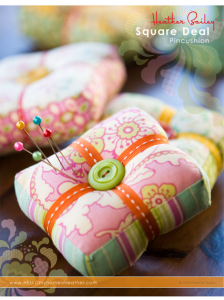 If we missed your favorite pincushion project or tutorial, share it with us by leaving a comment on this post with a link!